The PROC QLIM models such as qualitative response or limited dependent variable models assume that the errors are independent of the explanatory variables. If this assumption fails to hold, the distributional form that the likelihood is based on is misspecified and the obtained coefficients are inconsistent. The exogenous explanatory variables are , and the continuous endogenous explanatory variable is . 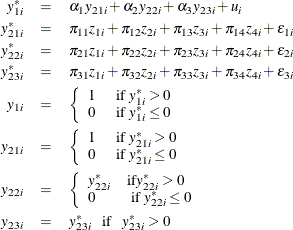 For simple examples like the preceding ones, you can derive the likelihood function easily. However, as the number of endogenous explanatory variables increases, if these variables have a discontinuous nature, if simultaneity among equations exists, or if a combination of these occurs, then the derivation of the likelihood function becomes cumbersome, or, in some cases, the likelihood function does not even have a closed analytical form. PROC QLIM can handle endogeneity regardless of the nature of the endogenous explanatory variables for a single structural model. In the case of one endogenous explanatory variable, PROC QLIM reports the FIML estimates that are calculated by using the analytical likelihood function that is obtained from the joint distribution of the dependent variable and the endogenous variable. When there is more than one endogenous explanatory variable, the analytical form of the likelihood function is usually not available; in this case PROC QLIM reports the simulated maximum likelihood estimates. For the simulated maximum likelihood estimation method, PROC QLIM uses the Geweke-Hajivassiliou-Keane (GHK) simulator (see, among others, Hajivassiliou, McFadden, and Ruud (1996)) to simulate the joint distribution of the dependent variable and the endogenous variables. The simulation is facilitated by assuming that the error terms in the latent models for the dependent variable and the endogenous explanatory variables are distributed as multivariate normal. When you estimate a model in PROC QLIM, you can take the endogeneity into account by writing the structural model along with the reduced form models for each endogenous variable. Examples are provided in the following sections. Note that the dependent variable should not occur in the models for the endogenous explanatory variables, because this causes inconsistent coefficient estimates. In other words, you should write the models for the endogenous explanatory variables as reduced form models. PROC QLIM does not handle simultaneous equations models. Failing to reject the null hypothesis favors the decision that is exogenous in the model for . When there are two or more EEVs, the test becomes the joint likelihood ratio test of whether corresponding correlations are 0 or not. Testing is the same as testing whether is correlated with or testing whether is endogenous or not. Because are unobserved, you can replace them with the OLS residuals from the model for and apply a robust t test. Note that even though is binary (or censored), the test is still correct under . This approach can be summarized as a two-step procedure. 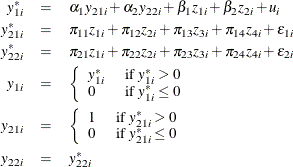 In the first step, generated regressors—that is, the OLS residuals from the models for each of the EEVs—are obtained. In the second step, the structural model that includes the generated regressors as additional explanatory variables is estimated by the maximum likelihood method and the joint significance of these generated regressors is tested by the Wald test. In this case, PROC QLIM estimates the structural model , including the overidentifying IV as an additional explanatory variable in this model, jointly with the reduced form model . Then it uses the likelihood ratio test to test the hypothesis that the overidentifying IV is insignificant. Rejecting this hypothesis raises doubts about the validity of the instruments and . Note that, as long as you have continuous endogenous explanatory variables, the test result is invariant to which overidentifying IVs you specify in the test.